Daphne tells Des she's been a selfish brat. She wishes him well and says they'll always be mates. Max is upset - he thinks Maria has a boyfriend. Maria and Danny get home from the theatre and find they have been robbed. Everything is gone. 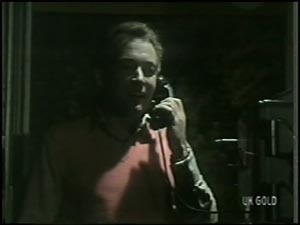 Danny runs in and tells Jim that they've been robbed. He comes over with Danny to help. Maria has rung the police when Danny and Jim arrive back. Just about everything is missing - Maria's jewellery and all Danny's electronic gear. Jim gets suspicious about the theatre tickets they won - it sounds like a bit of a coincidence. He suggests Danny rings the radio station to check. Maria says they are insured, but her jewellery is irreplaceable. She thinks about it and thinks she didn't lock the deadlocks properly - would that affect their claim? Danny comes back from ringing the radio station - they don't know anything about free tickets. The place has been tidied up. A man comes round to see Maria from the insurance. His name is Richard Morrison. They chat about the deadlocks and he says there's no mention of them in the policy - the deadlocks were installed after they took out the policy. He says he won't mention them to the company if Maria doesn't. Maria is very relieved. She offers him a cup of coffee but he says that perhaps they could have one when they're finished with the work. Des is shocked that Maria forgot to put the deadlocks on. DAPHNE: Des. What are you going to do about your mother? DES: Volunteer her as an astronaut? Daphne wants to know if Des is going to tell her that he's getting married. DAPHNE: Is she coming to the engagement party? DES: I thought I'd keep it as a happy affair. Daphne thinks Des is being unreasonable. She thinks maybe Eileen is lonely and only acts that way to get attention. 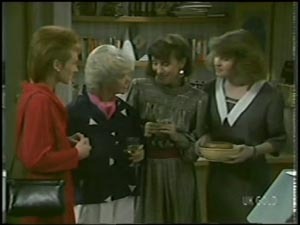 Des says she's a selfish, moralistic old cow and tells Daphne not to get sucked in by Eileen. Maria and the insurance man are chatting in a friendly way. The claim is looking quite good. He's surprised that Maria has grown up children. Maria explains that she was married too young and she and her husband are separated. She shows Richard out. On the doorstep, he asks Maria if he can take her out to dinner. Maria accepts and they agree on tonight. Helen is painting when Maria comes up to ask what she can make for the party. Helen notices Maria's good mood and she explains about the good insurance claim. Helen picks up on "Richard" and Maria admits that she's going out to dinner with him tonight. Helen is quite pleased - it's just dinner. Maria and Richard have arrived. 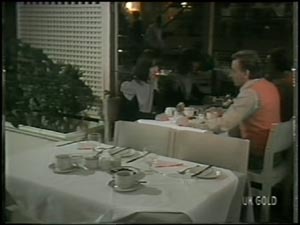 They chat over dinner about their ex-spouses - Richard too is separated from his wife, divorced in fact. But he never had kids and that's something he'll always regret. Maria thins they are getting a bit personal considering they've only just met. Richard is saying goodnight to Maria. He kisses her hand. Danny is studying when Maria comes in. Maria doesn't think that she'll be seeing Richard again. Danny thinks he was a bit of a dag anyway! Maria says they didn't have very much in common. 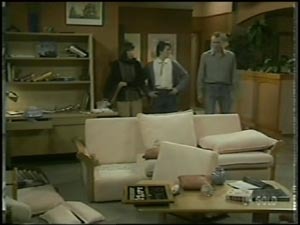 Joan tells Des that the kids are at the babysitters. She's a bit nervous about meeting Des's friends. Des gives her a present - an engagement ring. They have a pash. The party is in full swing, but Des and Joan haven't arrived yet. Helen asks Maria about her date. The boys talk about Des's bucks night and says they'll have to get another stripper because Daphne's "family" now! 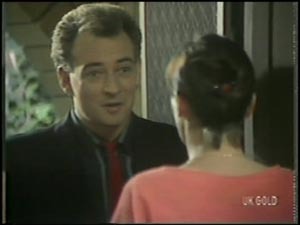 Des asks Paul to be his best man again and he accepts happily. 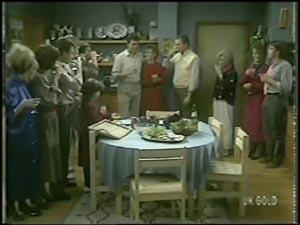 Later, Jim makes a toast to Des and Joan. Des makes a speech too. He tells them they've all become like family to him and that he thinks he's got the right girl in Joan. Julie looks a bit upset as he makes a toast. Jim follows Julie into the living room and finds her trying not to cry. He talks to her sympathetically and says she shouldn't bottle up the thing with Phil, it's not good for her. He tells her that lots of relationships don't work out, but she can't allow that to make her bitter. Julie says that the pain is too much to bear. JULIE: Dad - is this how you felt about Anna? She apologises profusely to Jim. He says that sometimes you have to be philosophical about these things. Julie starts to sob and cries in Jim's arms. She feels like she'll never be happy again.